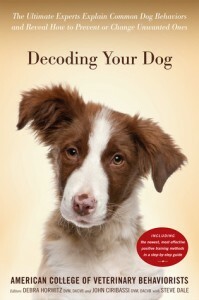 Decoding Your Dog: Explaining Common Dog Behaviors and How to Prevent or Change Unwanted Ones, by the American College of Veterinary Behaviorists, is my 'collection of essays' book for my 2016 (Blended) Reading Challenge. This was nowhere near as awesome as I had hoped. A lot of it was really basic stuff, but I guess that's helpful for people who have never had a dog before. My biggest issue is that it was just so repetitive. Not just the 'basic rehash' portion at the end of the chapters, and not entirely the fact that chapters were written by different experts (that particular repetitiveness – a word they felt compelled to define, btw – should have been fixed by the editors)...most chapters themselves were constantly repeating the same thing. Had it been more succinct, it might have been a third as long. Granted, the book itself can be boiled down to “More exercise/routine”, “Feed from a puzzle toy”, “Rule out medical issues”, and “Hire a veterinary behaviorists”. The latter isn't surprising given who wrote it, but they are definitely needed in some cases. Still, I had hoped for more understanding of dog behavior myself, which this book didn't really provide. I did learn a lot about different medical issues that could be the culprit for issues we may initially believe are behavior issues. There are a few tips for troubleshooting problems that I may use in the future. They mention “swatting” as punishment early on, and I initially thought they were suggesting such a thing. I nearly stopped reading there. It was later in the book where they started discussing how physical punishment has most often made things worse and should be avoided. All in all, I think these are some good essays by experts, but the editors should have done a much better job. The title is misleading, imo,as this didn't really teach much about 'decoding' behaviors. The 'prevent & change' portion of the subtitle is right on, I guess. For new pet owners (who have never read a single dog book before) or people looking to troubleshoot issues, this would be great. For people wanting to learn more about animal behavior and communication, I feel this misses the mark.